February’s Robotics Showcase Extravaganza was a great success. We thank all who helped to make it so, and hope to make this an annual event. Over 300 patrons and 50 robotic club students participated in robotic activities outside and inside the library. The Extravaganza was sponsored by the Henry Cluster STEMM Foundation, San Carlos Branch Library, and San Carlos Friends of the Library (SCFOL). Robotic clubs from local schools showed off their designs and demonstrated their prowess with robots. Pictures are on our website. Hope everyone had as much fun as my grandsons and I did! Let Managing Librarian David Ege know if your school or club would like to be a part of our future events. The “In A Nutshell” of our branch’s Children’s Spring Events is now available on our website under “Youth Activities” at sancarlosfriendsofthelibrary.org. This double-sided trifold flyer can be downloaded and printed as a quick reference to the reoccurring and special youth activities offered at the San Carlos Branch Library through May. In fact, there are currently 186 informative articles on our website covering SCFOL and the San Carlos Branch Library’s current and historical hot topics. Check them out and sign up for our website-based newsletters. We encourage kids, and their parents, to broaden their knowledge of other cultures. On Saturday, March 10, 12:30–1:30 p.m., the culture of Islam will come to life via a special storytime for the younger set, but all age groups are welcome to attend. There are over 1.8 million Muslims in the world, and there is much for us to learn about their culture. The program will be presented through stories, songs, and a craft. Following the above March 10 presentation, take time to browse the library’s shelves, check out some springtime storybooks and then experience the celebration of “Spring and Nowruz — the Persian New Year Celebration” from 2–3 p.m. Enjoy traditional Persian music and learn the history of this ancient holiday. This program will be presented by Dornob, a collective of musicians performing and teaching Persian classical music in San Diego since 1985. Everyone is welcome to this free presentation. Kids can continue exploring other cultures on Wednesday, March 21, 2:30–3:30 p.m., by joining us for “Global Connections: Meet a Peace Corps Volunteer!” This program is designed to help ages 4–10 experience different countries and cultures through the eyes of a two-tour Peace Corps volunteer, Aisha Salleh. One tour was in Bangladesh, a tropical country in southern Asia located between India and Myanmar; her other tour was spent in Togo, a country in West Africa. Aisha will share stories and her experiences, as well as lessons about the differences and similarities among cultures. Challenge Island is a science program for kids ages 8–12. During “Canopy Campground,” kids will learn about the different layers of the rainforest, and how the canopy layer is home to many forms of life. They will then design and build a rainforest tent, and deck it out in their own tribal style by adding fun and unique features. March 28, 4–5:15 p.m. Registration is required; please call 619-527-3430. Julianne Ricksecker has just returned from Brussels where she won the 2018 Rene Carcan International Public Prize. Ricksecker is best known for her work in various techniques of original printmaking, most frequently in á la poupée color etching. This process renders sumptuous color with unusual depth and richness for metal plate printmaking. 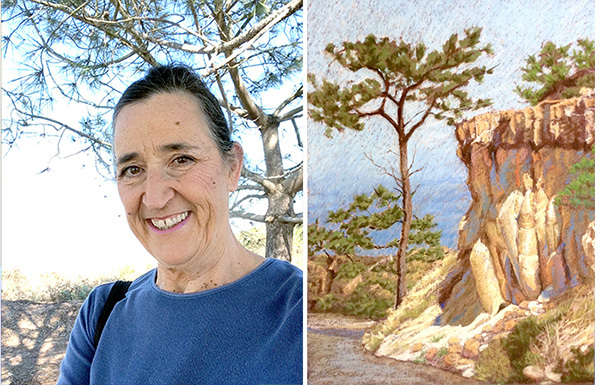 Artist Julianne Ricksecker’s color etchings will be on display in the Art Gallery through March 29. Ricksecker has won numerous awards for her pastels, watercolors and etchings; her art is on display internationally and at local venues. Ricksecker’s art will be on display in our Winer Family Community Room & Art Gallery until March 29; her artist reception is March 17, noon–2 p.m. Refreshments will be served. March 16, 2–3:30 p.m., learn about local hiking trails in the fifth edition of “Afoot & Afield in San Diego County,” with co-author Scott Turner. Turner has personally hiked every trail listed — from easy jaunts to hard peak-bagging treks. Friday, March 23, 2-3 p.m., meet Jill Hall, author of No. 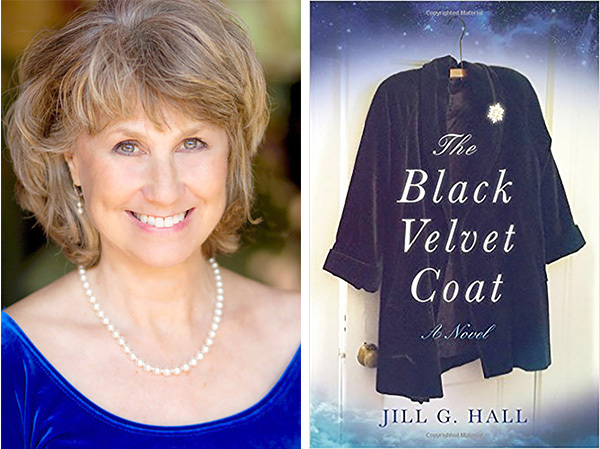 1 Amazon bestseller, “The Black Velvet Coat.” In 2016, Hall was selected as a Writer to Watch (W2W) by the Friends of the San Diego Central Library. Hall’s debut novel follows the lives of struggling artist Anne McFarland and heiress Sylvia Van Dam. Anne purchases a thrift store coat originally owned by Sylvia; eventually their lives intersect as their individual life stories develop. April 12, 12:30–2 p.m., the Library Book Club is discussing the novel, “A Gentleman in Moscow,” by Amor Towles. The story develops in 1922 Moscow when Count Alexander Rostov writes a poem that is deemed encouraging revolution, resulting in his house arrest in Moscow’s luxurious Metropol Hotel. Luxury living is harder than you think; Rostov lets you in on his methods of defeating ennui! OASIS: March 9, 2-3 p.m.: “Salt, Sugar, Fat…Oh My!” Meet the foods that can sabotage anyone’s healthy diet and weight loss efforts. Learn to distinguish culprit foods that can sneak into your diet. Every attendee will receive a free healthy snack and wellness guide with recipes and tips for healthy living. — Sue Hotz is board member and publicity chair of the San Carlos Friends of the Library. Reach her at publicity@sancarlosfriendsofhtelibrary.org.